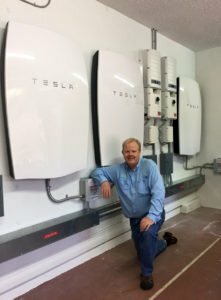 Since 2016, Brilliant Harvest has been a Certified Tesla Powerwall Installer, undergoing a grueling certification process that included significant study and performance review by Tesla field technicians. Since that time, we have seen how lithium-ion storage batteries – in particular, Tesla’s Powerwall – are revolutionizing home energy usage and storage for homeowners. The Powerwall is changing the game for solar adopters, making it possible to consider a life free of the grid and ever-increasing power bills. Home batteries can also serve a number of purposes for those who install them. 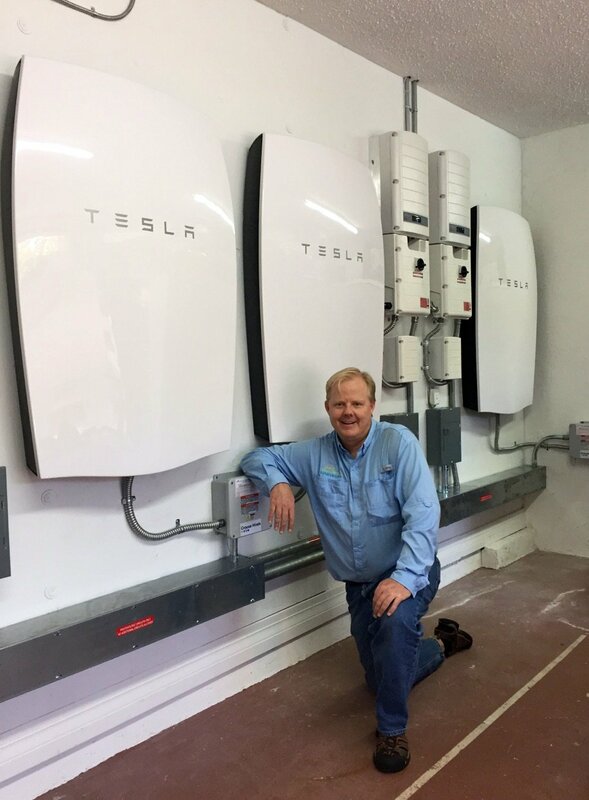 Read on to learn how some of our local clients are using their Tesla Powerwall home batteries. When paired with a solar photovoltaic (PV) system, the Tesla Powerwall provides power to a home during a grid outage. Florida is a state prone to hurricanes and, thus, extended power outages. Last summer, Hurricane Irma knocked out the power for many residents for a week or even more, in some cases. Florida also has a higher than average population of elderly residents. Many of these seniors require dedicated home health equipment to maintain their well-being. The loss of power can cause serious hardship – even harmful health repercussions – for these folks, so backup power can provide tremendous peace of mind to an elderly homeowner as well as their friends and family. We had one client whose husband had a long-term health issue. She absolutely needs to have power for doing the laundry every day. We installed a Powerwall system that ensures she can do the laundry (it also backs up her refrigerator and other appliances); it proved its mettle during Hurricane Irma, when their home lost power for nearly a week. This client loves the peace of mind the Powerwall home battery offers her. We have another client who falls into this category. He had a whole house generator on his home, paid for the ongoing maintenance, and ran the generator every month. When Hurricane Irma arrived, it ran fine for about 18 hours and then it ran out of fuel. Unfortunately, because power was out throughout his entire community – as well as in surrounding communities – no gas stations were open to resupply his generator. This was a nightmare he never wanted to repeat, so he has installed solar PV with the Tesla Powerwall, which recharges every day. Now he will never have to worry about fuel supplies after a storm. Since installing his new system, he has been off the grid more days than he has been on grid. As you may know, many electric utilities (mistakenly) see solar as a threat to their monopoly business model. In recent years, they have stepped up their attacks on net metering programs. In some cases, they have drastically reduced the rate they pay for solar energy sent to the grid, thereby reducing the value of putting solar PV on your rooftop. When setting up the Tesla Powerwall system, you can select a feature known as “self-consumption.” Self-consumption allows you to preferentially charge and discharge the Powerwall batteries, thus reducing the amount of power sent to and taken from the grid. This ensures that you get full retail value for the electricity your solar array produces since you simply keep the energy onsite instead of having to send that electricity back to the grid. This feature can be utilized in situations where time of use rates are in effect. Using the batteries to preferentially discharge during periods of higher grid rates, and charge (from solar) when rates are lower. One of our clients resides in Peace River Electric Cooperative (PRECO) territory. She wanted to adopt solar and was interested in a battery backup for her home anyway, but PRECO recently changed their solar rates, reducing the rate paid for solar energy dramatically. The self-consumption capability of the Tesla Powerwall system clinched her decision to install it. She now uses the battery system to reduce the power she sends to the grid, instead storing it and using it later in the evening. Using the Powerwall, she is doubling the value she obtains per kWh for the energy she produces and gets the security of battery backup as part of the deal. You may be wondering: if a homeowner can do all this with a battery, what could a utility company do with hundreds or thousands of these batteries? It’s a great question. In the future, distributed battery backup systems on homes and businesses will be networked together via the internet to become a “virtual power plant.” Utility companies could sign an agreement with a group of these battery system owners who could allocate a portion of their battery capacity to “grid services” and get paid to provide “dispatchable” power (dispatchable power can be turned on or off at will, unlike pure solar PV, which produces power on its own schedule). The remaining capacity would provide the same great features to the homeowner, and when the grid goes down, the battery reverts to normal off-grid operation, charging from solar every day. Click HERE to read how Australia is planning to install solar arrays and Powerwalls on 50,000 homes to create the biggest virtual power plant in the world. We may even see utility companies get into the business of supplying battery backups to homeowners in their service territory or at least giving them a large discount. This will require a change of thinking within many traditionally-minded utility companies; however, trials of this concept are already underway in a few locations. As you can see, the future is bright with solar photovoltaics and the Tesla Powerwall system. Please give us a call if you’d like to discuss this topic further.